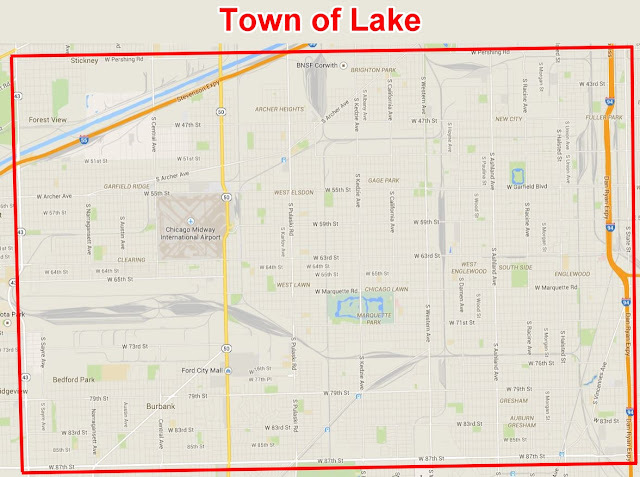 The Town of Lake was bounded north by 39th street, east by State street, south by 87th street, and west by Harlem Avenue (Lyons, IL eastern border). It was incorporated as a village with the above boundaries in 1865. Two years later the charter was amended, giving the authorities additional power. Within the town of Lake many separate villages came into existence and gradually grew together and became a part of Chicago. Among the first settlers were Hugh Chittick, John L. Gerber, Samual Beers, Joseph Oswald and Daniel Berckie, who located near 59th street and Ashland Avenue. A little later Ira J. Nichols, William Brooker and F. A. Howe located on what afterward became Englewood as early as 1856. Early in the 1850s John Caffrey and S. S. Crocker settled near where the Union Stock Yards were. Other early residents of this portion of the town of Lake were Milton F. Patrick, Michael Rich and George W. Wait. In 1861 the town of Hyde Park was formed from the town of Lake. The incorporation was effected in February of that year. Hyde Park village was organized in 1872. Its boundaries were Pershing Road (39th Street) on the north, 138th Street on the south, State Street on the west, and Lake Michigan and the Indiana state line on the east. Among the small villages in Hyde Park in early times were Colehour, Irondale, Rosedale, Kensington and Riverdale. In 1868 policemen in addition to constables were put at service throughout the township. A large increase in police was made in 1873 and again in 1880. One of the first improvements made by the town of Lake were works to secure pure water. The engine, etc., was located at 68th street and the lake, in 1873. At that time the town of Lake and Hyde Park constructed these works as a joint improvement. In 1880 the town of Lake became the sole owner of the improvement, and later Hyde Park constructed its own water system. As early as 1881 the town began to spend much money in properly draining many wet tracts of land. As the result, hundreds of acres which previously had been under water half the year appeared permanently above the subsiding water levels. A little later great improvements were rapidly made in the direction of good roads and streets. The most noticeable of many industrial improvements of the town of Lake were of course the famous Stock Yards. The railway roundhouse alone employed many thousands of men and furnished a living for their families. The manufacture of brick was an early enterprise of the town of Lake. The Union Stock Yards and Transit Company was incorporated in February of 1865. About one million dollars was spent to put the yards in efficient operation at the commencement. In 1889, the Chicago city limits expanded south to 138th and State Street and to the west 87th and Cicero by annexing the Town of Lake and the Village of Hyde Park. The Krupp Gun Pavilion at the 1893 Chicago World’s Columbian Exposition: The world's largest gun. A brief biography of overachiever Colonel Rosell M. Hough (1819-1892).